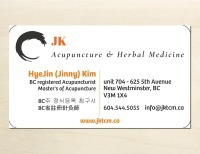 I am a BC registered Doctor of Traditional Chinese Medicine practitioner (Dr. TCM) with CTCMA (College of Traditional Chinese Medicine Practitioners and Acupuncturists of British Columbia). 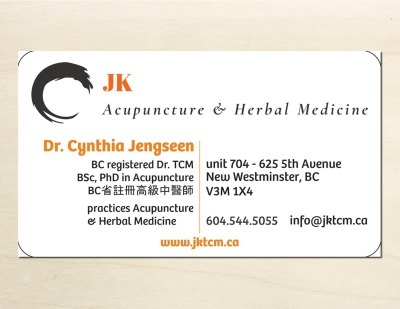 After graduating from UBC with a bachelor degree in BSc and a brief working period, I became interested in TCM when some of my health problems were cured by acupuncture and Chinese herbs. I then returned to Guangzhou, China, where I was born and raised, in order to pursue professional training in both acupuncture and herbology at the Guangzhou University of Traditional Chinese Medicine. 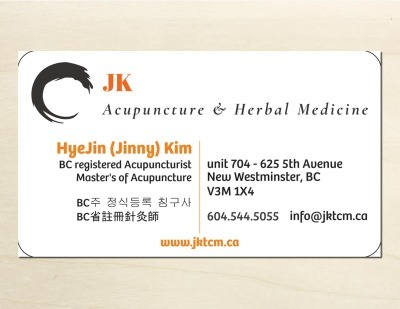 It is here I ultimately received both my master’s and doctoral degrees in traditional Chinese medicine (acupuncture). In over seven years of training, I have been deeply influenced by the holistic theory of TCM. It is my goal to use my skills to help each client achieve a balanced state of well-being. My practice focuses on the treatments of any acute or chronic pain, sleep disorders, anxiety, depression, stress, fatigue, digestive issues, frequent cold & flu, menstrual issues, menopause, hemorrhoids, acnes, eczema and more. Acupuncture is an amazing TCM Healing method that uses needles. It is impossible to define acupuncture without Qi (or energy). 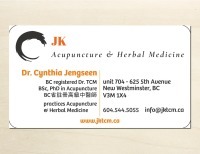 Acupuncture needles help the Qi flow smoothly by stimulating the acupoints on your body. During the time of treatment, your body can be readjusted, without any harmful side effects. The most important thing is to realize that people were born with a self-healing ability. TCM practitioners recharge that self healing function in your body. I am here to help your body awaken its healing ability. I can accomplish all this, but only with your trust. I speak English, Korean and Mandarin.